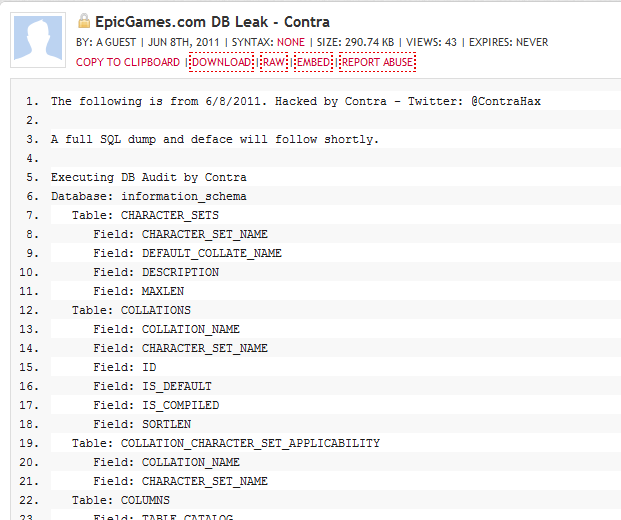 Epic Games ( https://www.epicgames.com/ ) Database Hacked by Contra (Hacker) , He hack whole database and Leak all database structure online at http://pastebin.com/X455ZARH . The Site of Epic Games is currently showing Database connection error. Established in 1991, Epic Games develops cutting-edge games and cross-platform game engine technology.The company has created multiple million-selling, award-winning titles in its Unreal series, including Unreal Tournament 3 for PC, PLAYSTATION®3 and Xbox 360®. Epic’s Gears of War won over 30 Game of the Year awards, and the sales of Gears of War and Gears of War 2 have eclipsed 12 million units. Epic’s Unreal Engine 3 is the four-time winner of and Hall of Fame inductee for Game Developer magazine’s Best Engine Front Line Award. Unreal Engine 3 has also been recognized as the number one game engine by Develop magazine. Gears of War 3, the most anticipated blockbuster of 2011, is expected to hit stores September 20.